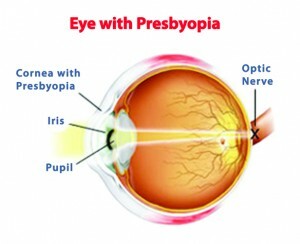 Presbyopia is reported quite frequently with physiologic aging process. There are many management options that help in correction and to restore optimal near vision. Presbyopia suggests an impairment of near vision that interferes with activities like sewing, reading or any other activity that requires focus of ocular muscles. Presbyopia is a result of normal age related degeneration in the visual apparatus that usually begins after the age 40 in most cases. Presbyopia is a common problem that is also reported in individuals who never experienced any difficulty with near vision. Research data and statistics indicate that the median age of survival has significantly increased in the past few years suggesting a large population is at risk of developing visual impairment or presbyopia as part of aging process. This has a significant impact on the productivity and overall medical expenses in the cosmetic visual surgeries, eye-care products, prescription glasses and contact lenses. Generally presbyopia is an easy to diagnose condition and most people begin to suspect it when they develop blurring of vision and an inability to develop clear visual image while reading a book, magazine or doing a detailed work that require maximum convergence or visual focus. A progressive difficulty in performing tasks that require near vision or focus. If you wear spectacles for distant vision, you will experience a better visual quality for near vision after removing spectacles. Frequent episodes of headaches that aggravate after reading, sewing, knitting or other similar activities. Research report of WHO suggest that millions of people all over the world do not have the facility to afford prescription reading glasses or contact lenses that leads to high morbidity and loss of productivity all the world. As part of the age related wear and tear process, the muscles and proteinous tissues of the body undergoes degenerative changes that results in loss of flexibility or elasticity of certain elements like lens. As part of the visual activities, the lens alters their shape, width and form to converge the pupils in order to produce quality image. However, with less flexible or elastic lens, the visual activities are greatly compromised. In addition, with advancing age, the muscles that support, strengthen and control the activity of lens also suffer significant denaturation and degeneration resulting in an overall less flexible and functional visual apparatus. What increases your risk of developing presbyopia? Certain medications or prescription drugs that interfere with the activity or strength of visual muscles like anti- histamines, anti-depressants or diuretic medications. The diagnostic process is fairly easy and requires some basic eye tests. Make sure to discuss your personal, family, medical and drug history with your eye-doctor. According to the recommendations of American Academy of Ophthalmology (AAO), every individual requires a complete and thorough eye examination at the age of 40 (regardless of any risk factors). Despite the fact that presbyopia is a progressive condition, there are a number of factors that greatly determine a positive outcome and management of symptoms in presbyopia patients. Spectacles or eye-wear that have bi-focal lens are helpful in the management of presbyopia and is a great choice in individual who require prescription glasses for distant vision. With PALS, you can enjoy both distant vision and quality near vision in one pair of spectacles. The upper part of the bi-focal lens offer refractive power for distant vision and lower corner provides help in near vision. Since presbyopia is a progressive condition, you may have to revise your prescription periodically (or as suggested by your healthcare provider). In case you wear regular contact lenses for distant vision, speak to your eye-doctor for especially designed reader glasses that provide optimal visual acuity with distant contact lenses. Multi-focal contact lenses are also a preferred choice in presbyopes that are available in a number of varieties and lens materials. This is a simple approach that allow consumers to wear one lens (for near vision) in their non-dominant eye and other lens (for distant vision) in their dominant eye. Since the image formed in the brain is the product of combined results from both eyes, your visual receptor cells will optimize the image with mono- vision. Conductive keratoplasty as the name suggest, is a corneal surgery that requires radio- frequency waves to create curvature changes in the cornea for optimal quality near-vision. In vast majority of cases, the procedure is performed in only one eye (utilizing the ideology of monovision correction). Although it is a fairly helpful intervention that produces quality results; however, it has been observed that in vast majority of cases it has been observed that the results are temporary and difficulty with near vision return gradually. This is a relatively new technique that is currently in the trial process for US FDA approval. As a part of this procedure, a laser beam is utilized to introduce multi-focal ablation of corneal tissue. LASIK procedure corrects one eye for correction of distant vision and other eye for near vision. The mono-vision approach helps in improving overall image quality. This is yet another procedure that allows installation of a new lens that helps in correction of presbyopia. A number of other interventional procedures are also underway that may helps in improving overall visual quality. What Is Blepharoplasty and How Does It Help?